Jollibee’s Head of Marketing and Global Chief Marketing Officer Francis E. Flores (seventh from right) and Assistant VP for Marketing Kent Mariano (sixth from right) acknowledges young Filipino achievers who excelled in their respective fields and served as Generation Y’s role models. In photo from left: agricultural entrepreneur Jairus Ferrer; outstanding student and aspiring doctor Christopher Valentin, spoken-word artist Juan Miguel Severo, record-breaking runner Mea Gey Ninura, international race car driver Marlon Stockinger, world-renowned all-girl pop group performers 4th Impact, social entrepreneur Rachel De Villa, young inventor Angelo Casimiro, and international model Kelsey Merritt. The world-class roster is composed of talented artists and reel-and-real life couple James Reid and Nadine Lustre; international model Kelsey Merritt; social entrepreneur Rachel de Villa; young inventor Angelo Casimiro; spoken word artist and performer Juan Miguel Severo; model and agricultural entrepreneur Jairus Ferrer; record-breaking runner Mea Gey Niñura; outstanding student and aspiring doctor Christopher Valentin; international race car driver Marlon Stockinger; and world-renowned all-girl group 4th Impact. Jollibee’s newest breed of Yumbassadors embodies the langhap-sarap lifestyle by giving their 100% on the things that they are most passionate about. 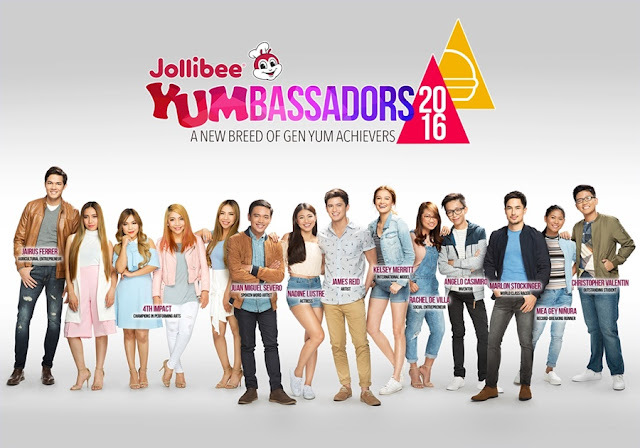 “This year’s batch of Yumbassadors are proof of how millennials are – passionate, driven and determined, and always going for the best. This generation, the Gen Y or #ProudGenYum, are impressive individuals and each of them are out to change the world,” shares Jollibee Philippines Head of Marketing and Global Brand Chief Marketing Officer Francis Flores. World-class performers 4th Impact was joined onstage by everybody’s favorite Jollibee as they danced to their most popular hit covers.